It's time for my last post on my summer favorites. I've talked about my wardrobe favorites, my beauty favorites and now today I'm talking all about my favorite summer accessories. I had to save the best for last. I love accessories! Accessories can totally make an outfit. With out them, you're just wearing clothes, with them, it's a look. This summer I have been on repeat with some of my favorites. 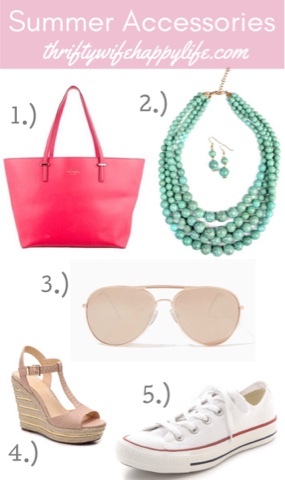 Here are my 5 favorite accessories this summer. 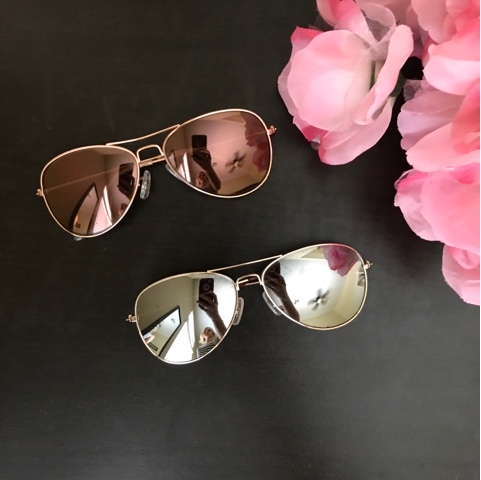 Mirrored Aviator Sunglasses- I love all my sunglasses, but this summer I've really been into my mirrored aviator sunglasses. I started to obsess over this style this spring and I ended up picking up a couple pairs at Smith's, my local grocery store. I'm not ashamed to say that I buy accessories at the grocery store. They are super cute, very affordable at only $5, plus I'm at the grocery store at least 3 times a week. It's the most convenient spot for me to shop at the moment. Turquoise Accessories- I love the color turquoise. Next to pink, I think it's the most common color in my wardrobe. I really love to accessorize with turquoise, because I feel like it's such a summery color. It looks great with black or you can pair it with a color. Currently, I have 2 turquoise necklaces that I wear all the time. I also have a clutch and bracelet that I wear all the time. Wedge Sandals- I love wedge sandals in the summer time. They are so much more practical than a pump. 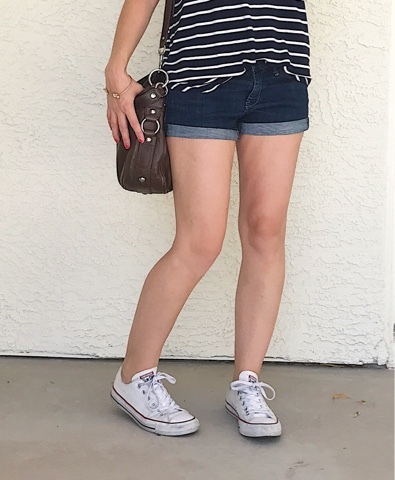 I have 2 favorite pairs of wedge sandals that I'm sure you have noticed in a lot of my outfit posts this summer. One pair I bought probably 10 years ago at Kohl's. I know I found them in the clearance section for a great price, but I can't remember exactly how much I spent. My other wedge sandals are a Target clearance purchase a few years back. I've linked some similar options below. 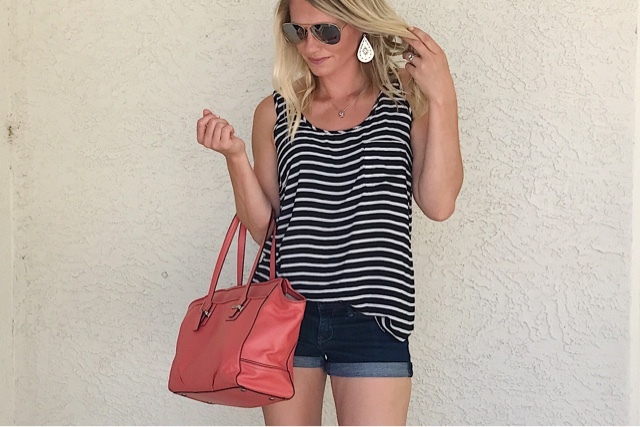 Colorful Purses- I love adding a pop of color to my outfit with a purse. 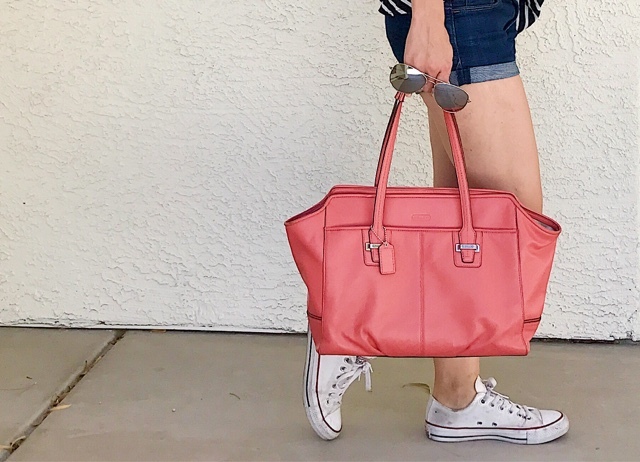 Colorful purses can be so fun in the summer. 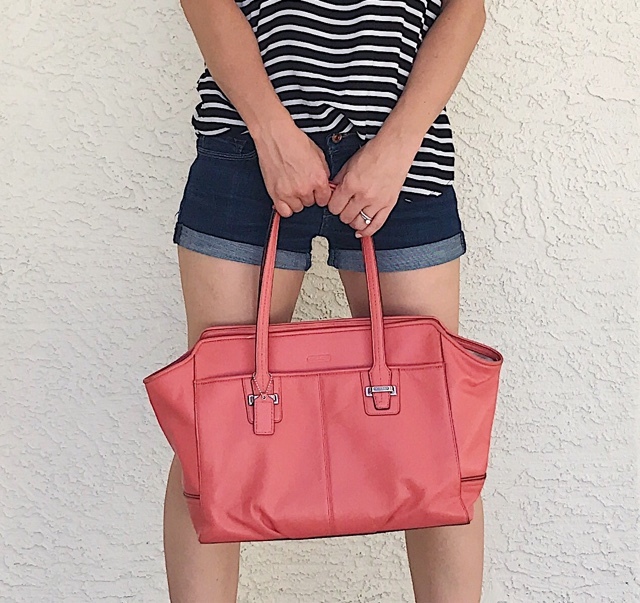 I have my coral Coach purse that I try to bring out whenever I feel like my outfit is lacking in color. It defiantly helps give it that slash of color. Converse- Lastly, I want to talk about my converse chucks. These are not only my favorite summer shoe, but they are my all around favorite everyday shoe year round. This summer, I've been wearing them with a lot with shorts and dresses. 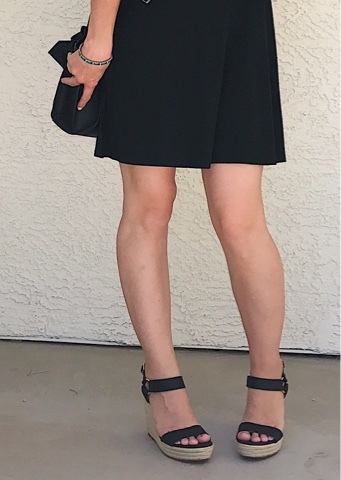 I just love how versatile they are with my everyday wardrobe. Those are my favorite accessories this summer. I hope you enjoyed this series. My favorites are pretty basic, but that's why they are my favorites. Enjoy your last weeks of summer and hopefully you can enjoy your summer favorites too!